Chicago Exotics has been in business since 2000. We've been quickly establishing ourselves as the region's premier exotic animal hospital. Our mission is to be the best care facility in the Chicago land area for avian and exotic animals. We do offer 24 hour critical care services in association with our emergency partners, Blue Pearl Skokie. Take a tour of the facility. Dr. Susan Horton is a University of Illinois graduate (class of 1995). Her interest in birds and exotic animals followed her into veterinary school where she worked for four years with the Director of Exotic Animal Medicine at the veterinary college, Dr. Kenneth Welle ABVP avian. With Dr. Welle, Dr. Horton gained valuable experience and knowledge in the care of reptiles, birds, sugar gliders, hedgehogs and other small mammals, as well as ostriches, emus, and fish. Also while at the University of Illinois, Dr. Horton took an elective course in reptile and aquatic medicine through Texas A&M University (Aquamed) and the aquatic rotation and University of Florida CVM, Gainesville. She attends and teaches at several of the yearly veterinary conferences on avian, reptilian, and exotic animal medicine. Through these venues she has continued her education in medicine, surgery, cytology, radiology, and all other aspects of avian, reptilian, and exotic animal medicine. She has served on the board and helped produce several of these conferences as well. Dr. Horton has not confined her knowledge and expertise to the within ​walls of a veterinary hospital. Both Brookfield Zoo, Lincoln Park Zoo, and the Shedd Aquarium have used her services. She has also worked with the Illinois Dept. of Natural Resources in censusing the zoonotic diseases (contractible by people) of the local and statewide population of raccoons. She has lectured to the Aviculture Society of Chicago, the University of Illinois, Exoticscon, Purdue University, and many other local venues and has been published in the Veterinary Clinics of North America, Journal of Avian Medicine and Surgery, Journal of Herpetologic Medicine and Surgery, and "Invertebrate Biology". She is a member of the Association of Reptile and Amphibian Veterinarians where she has been President as well as being a member of the Association of Avian Veterinarians, the Association of Exotic Mammal Veterinarians, AAZV, and AVMA. She has been an associate editor for the Journal of Reptilian and Amphibian Medicine and the Exotic DVM Magazine. She has been featured in JAVMA as well as AVMA. The Red Door Animal Shelter uses her rabbit expertise with their many wonderful bunnies. She is also Medical Director for HAPPE Parrots, Red Door Animal Shelter, and Friends of Scales Reptile Rescue. Dr. Horton has studied and spoken nationally and internationally in Exotic Animal Medicine and Surgery. Here she is pictured with her endoscopy class at University of Georgia College of Veterinary Medicine. Dr. Horton has her own assortment of exotic (and not so exotic) pets including: geckos, quaker parrot, frogs, and one dog. In her "spare" time, Dr. Horton likes gardening, scuba diving, bird watching, camping, canning, brewing, bee keeping, and beading (and working on this website). Dr. Horton appeared in a Chicago Magazine article profiling Chicago's top veterinarians as well as being featured in the JAVMA recently. Dr. Stephanie Moy graduated from the University of Illinois in 2010. While attending school, she volunteered in the wildlife clinic. During her third year, she became a team leader. She was active in several student organizations. During her senior year she did two externships; one at John G. Shedd Aquarium and one at the Clinic for the Rehabilitation of Wildlife at Sanibel Island , Florida . After graduating from school, she still continues to volunteer at the John G. Shedd Aquarium. Prior to joining Chicago Exotics, she worked at another animal clinic where she treated dogs, cats, and exotic animals. She has lectured at the University of Illinois College of Veterinary Medicine as well as Purdue. She serves on the IACUC board for Northeastern Illinois University as well! Dr. Moy’s love of exotics stemmed from her 25 year old cockatiel. In her spare time, Dr. Moy likes to read, listen to music, cook/bake, and trying to be crafty. Dr. Moy was recently featured in a JAVMA article on Small mammals! Dr. Moy is ready for inspection! Dr. Valdes is a graduate of the University of Illinois Class of 2013. During school she was an active member of the wildlife clinic and was the exotic mammal representative of the non traditional species club. She also spent her summers and externships in veterinary school learning exotic animal medicine from the Belize Zoo, Decatur Zoo, Brookfield Zoo, the Bird Hospital at Mexico City’s UNAM, and the Carolina Raptor Center. Dr. Valdes has written many pet segments in popular magazines as well as contributing to the Ask a Vet section here. At home, Dr. Valdes enjoys learning and practicing foreign languages and is proficient in Spanish. She also enjoys playing guitar and holds a captive audience with her two chinchillas and pet cat. Dr. Valdes will be on maternity leave from February 25 until the beginning of May. She will return with limited hours. We congratulate her on her new addition! Dr. Strat-Zenoni is one of our part-time veterinarians. She is a 2003 graduate from Michigan State College of Veterinary Medicine. She loves exotic medicine, but is also certified in acupuncture and chiropractic medicine. She offers chiropractic and acupuncture medicine on Fridays as well as exotic medicine. You may also find her at the ER. Dana Varble, DVM joined our staff in 2011. She received her DVM from University of Illinois in 2003 and her Zoology B.S. from Southern Illinois University in 1990. Her special interests are venomous bites and stings, exotic pets, wildlife, and zoo animals, working canines, soft tissue and non-invasive surgery techniques. Kayla has recently joined our staff and can most often be seen on Fridays. She brings exotic medicine experience as well as being certified in chiropractic medicine. She received her DVM from University of Illinois College of veterinary Medicine in 2011. Dr. Melissa Giese was born and raised in the Chicagoland Suburbs. She graduated from the University of Illinois in 2017. Before she started college she was head volunteer of an exotic animal shelter where she worked with anything from fifteen foot long Burmese pythons to mountain lions. As additional education, Dr. Giese completed internships at Brookfield Zoo and Flint Creek Wildlife, a wildlife rehab facility handling specifically raptors. During veterinary school Dr. Giese was involved with the wildlife medical clinic as a public relations director and executive board member along with many of the exotic species clubs on campus. She enjoyed becoming involved with the public through conducting educational programs using the wildlife clinic's resident raptors. She also wrote the school’s Pet Columns on a variety of pet related topics. She believes that client education is an incredibly important part of veterinary medicine and continues to have a passion for education. 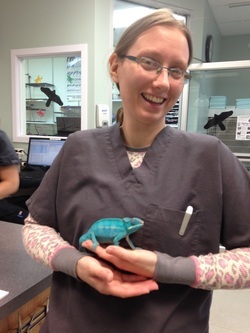 Dr. Giese enjoys spending time with her extensive pet family including leopard geckos, a Western hognose snake, a veiled chameleon, a bearded dragon, a crested gecko, a hedgehog, and many rescued dogs and cats. She also loves to craft, paint, make costumes, travel, and play videogames and board games. Rachel has joined our full time team of technicians. She is very interested in many aspects of animal care especially animal behavior. Kelly comes with lots of avian experience. She also loves rabbits and guinea pigs. Kelly is our bird whisperer. If you need a bird to eat, she can make it happen! Pictured here are Kelly's son and Kim's Daughter. Joel and recently rescued red tailed boa. Joel brings years of experience as a zoo technician as well as being a leader in the field of exotic animal microscopy. He is also quite the punster! Katie with a heavily sedated raccoon! Katie is one of our full time CVTs! She owns a yellow headed amazon and loves all aspects of exotic animal medicine. Kim joins our technician staff with zoo experience as well a a small menagerie at home. She enjoys keeping tarantulas as well as fostering reptiles for a local shelter. She enjoys all exotics but seems to really love guinea pigs and rabbits! Heather is one of our full time technicians. She works both at the front and the back of the hospital. We appreciate how detail oriented she is and her amazing organizational skills. Her favorite animals are rabbits! ​Noelle joins us with experience in wildlife rehabilitation. Betsy, also a new addition. Betsy brings a special love for all things aquatic!! Here is our Office Manager and receptionist Lamor. She is pictured with Steve, one of her favorite macaws!